The conversation around climate action can be difficult — it often feels like a conversation of trade-offs. Discussions are often framed as what do we need to lose to gain something else? However, it doesn’t need to be this way – in fact, far from it. We know there’s many climate policies that can be implemented while protecting economic growth and competitiveness, and helping to diversify the economy. Effective climate policies are designed to make sure economies stay competitive in a growing global low-carbon economy. One of the most popular of these policies is carbon pricing. This is why so many economists, business leaders, and world leaders of all stripes support a price on pollution as one of the most cost-effective ways to take climate action. With its solutions-oriented and entrepreneurial spirit, it’s no surprise that Alberta was the first jurisdiction in North America to address greenhouse gas emissions through pricing. In 2007, Alberta implemented the Specified Gas Emitters Regulation (SGER) to price carbon pollution. The program priced pollution from large emitters in the province and used the resulting revenue for investments in low-carbon technology. Since 2007, the province’s pollution pricing has evolved to a different system for large emitters, as well as an economy-wide carbon levy. Recently, however, the discussion in Alberta has shifted from how to best implement a price on pollution, to if one should be implemented at all. Pricing carbon pollution reduces emissions at the lowest economic cost, can drive innovation and be designed in a way that protects businesses’ competitiveness and low-income households. 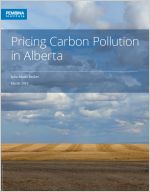 In our latest report, Pricing Carbon Pollution in Alberta, we explore Alberta’s past and present relationship with carbon pricing, and recommend how the province should move forward. In Alberta, economy-wide carbon pricing has been in place since 2017. It has served as a good example on how revenue raised from a price on pollution can be used to help ensure individuals, families, and small businesses are supported, and can be reinvested to lower carbon pollution even further, including into renewables, energy efficiency and clean tech projects and capacity building. Specifically, according to a recent Edmonton Journal article, revenue from the price on pollution has been invested into public transit ($33.5 million for Calgary’s Green Line and close to $230 million for Edmonton’s transit). With improved, better connected transit systems, more individuals will use transit and leave their car at home, ensuring long-term carbon pollution reduction. As well, more than 300 communities across the province have projects that will get funded through the carbon levy revenue. Instead of moving backwards by eliminating carbon pricing in Alberta, decision makers need to focus on how to best implement solutions we have already developed to address climate change — Carbon pricing being the most effective one to reduce pollution at the lowest economic cost. Not only should Alberta continue with an economy-wide price on carbon, it needs to also focus on committing to increasing the price incrementally over time, to drive further pollution reduction and make the impact on climate change that we know is so needed. With the right climate policies, including a price on carbon, Alberta can attract investment, spur innovation and compete in a decarbonizing world. This, paired with a pricing system for large emitters that rewards efficiency while protecting competitiveness, is crucial for Alberta to remain a leader in carbon pricing. Alberta likes to say it's had a carbon price since 2007. While technically this is true under the old Specified Gas Emitters Regulation, that system pales in comparison to the carbon pricing system currently in place. The output-based allocation policy announcement must stick to the Climate Leadership Plan principles without creating exemptions and loopholes that make the final policy ineffective. A carbon tax is about "taxing the bads, not the goods" says economist Mark Anielsksi.